Can Rice Commercialisation Transform Agrarian Society in Ethiopia? Driving through the Fogera Plain on a sunny September morning, lush paddy fields strewn out in front of us, it is hard to imagine we are in Ethiopia – the land of teff, a native grain crop which has been used for centuries to make injera, the country’s traditional flatbread. Arriving in Woreta town of Fogera Woreda, there is a palpable sense of thriving businesses, urban growth, newly built houses with iron sheeting roofs and emerging wealth. Only 10–15 years ago this area was highly food insecure and reliant on humanitarian and government food aid. So, questions abound: what has led to such a dramatic change in agricultural production, economic growth and livelihood security? We were here in search of some answers! The history of the introduction of rice in Ethiopia’s Fogera Plain highlights a fascinating picture of commercialisation, land use change and the elimination of food insecurity. 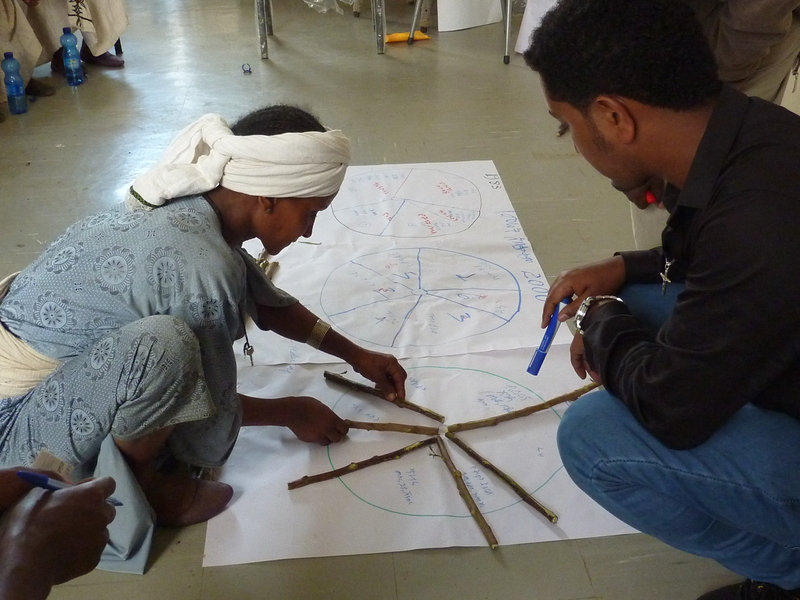 During our fieldwork in Fogera with colleagues from APRA Ethiopia and the UK, we undertook a number of key informant interviews and focus group discussions with male and female farmers from the uplands and lowlands. Using a range of participatory interview techniques, we sought to get a deeper understanding of how rice commercialisation has impacted livelihoods over a 28-year period. Using three historical points of reference – (i) 1990, the Derg period of military rule in Ethiopia; (ii) 2007, post-Derg; and (iii) 2017/18, the present day – we mapped out the trajectories of change in land use, production and consumption. The stories, some of which are highlighted here, provide textured insights into the impact of rice commercialisation on consumption and livelihoods, and the potential for rice commercialisation to act as a catalyst for the commercialisation of other industries – all of which have led to positive structural transformation of the local Fogera economy. We asked 2 groups of 8 men and women, and 2 local kebele experts – separated into whether their farms were primarily located in the uplands on lowlands – to describe the changing production/land-use patterns. The figure below illustrates that, since the introduction of rice, the total land area dedicated to rice has grown massively. With approximately 5 percent of lowland land given to rice in the 1990s, we see an increase to around 50 percent today. In the upland areas rice production is a more recent change, but has still doubled in the last 10 years. Future forecasts with the focus group participants suggest that the amount of land used for rice cultivation will level off in the lowland and increase significantly in the upland, as irrigation and incomes improve. Interestingly, the trends in rice commercialisation display a trade-off between sectors, viz. an increase in rice cultivation has led to a decrease in livestock farming, with both industries often competing directly for the same land. Similarly, ‘other cereals’ – primarily teff – show a substantial reduction overtime, evidenced by a reported consumption shift from teff-based injera to rice-based injera. In the lowlands, respondents indicated that their preference is now for rice-only injera, while in upland areas injera can use a mixture of rice and teff. 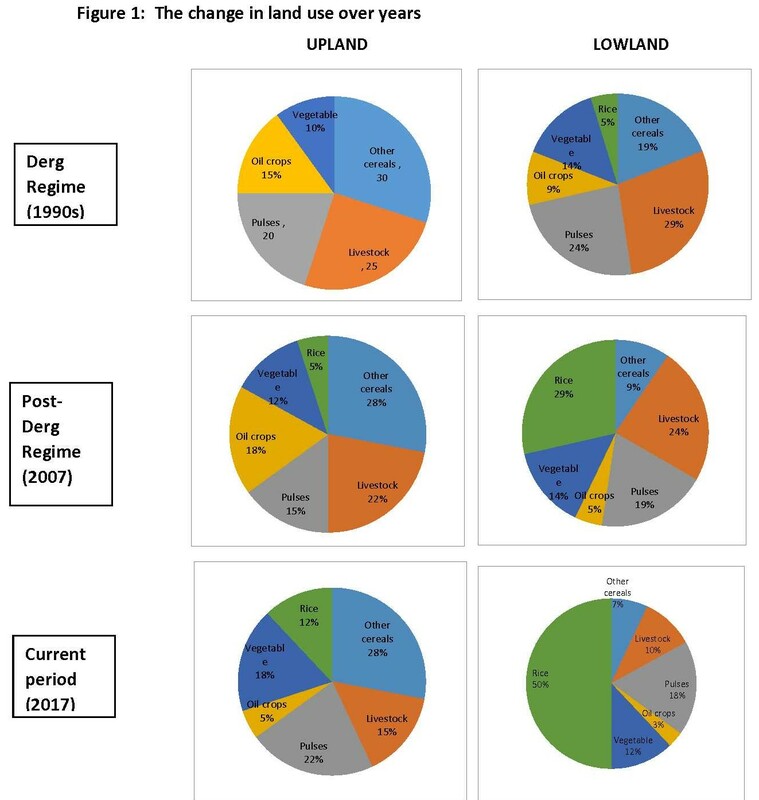 Land dedicated to vegetables and pulses appears relatively stable, however a discussion of the composition of the vegetable portfolio shows substantial change. In the Derg period ‘vegetables’ meant, primarily, onions and cabbage; whereas over time, tomatoes, potatoes and lettuce have entered the diet, and more recently field peas, red beet and carrots complement the vegetable intake. Interesting stories emerged of how the rice growing season has provided the opportunity for planting other crops between rice seasons. So, in some ways the income from and production of rice crowds in other cash-crop production, such as vegetables. Female respondents were keen to point out that there has been a big increase in vegetable consumption and the variety of products in the diet, largely as a result of higher incomes from rice farming, coupled with the increasing range of vegetables available on the market. Pulses still constitute a large part of the staple protein complement. In the Derg period, people said they were eating one substantial meal a day with little meat and no vegetables, although milk and cheese were a mainstay of the diet. Now, women report that people eat three to four times a day, usually comprising meat, rice, eggs, and vegetables. Higher disposable incomes can be used to buy foods not grown on the farm. Most of the people we spoke to during our short trip attributed the many positive changes – in land use, production, diet, urban development and income – to the introduction of rice. This is not to say that the rapid expansion of rice cultivation and commercialisation has been an unmitigated success for all households and individuals in the Fogera Plain. 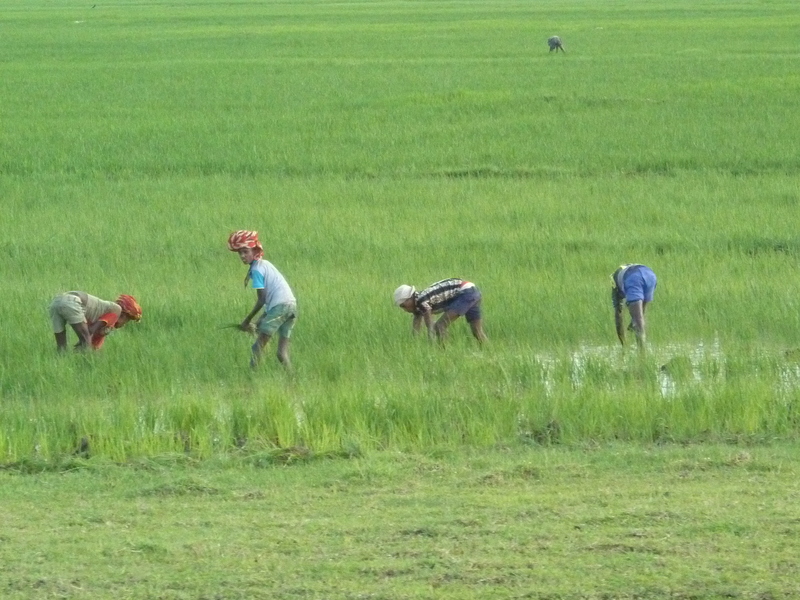 Local informants described how rice has crowded out other important traditional livelihood activities, particularly livestock keeping, due to the conversion of large portions of grazing land to rice production. This has led to the decline of the famous Fogera cattle breed in the area, which is adapted to grazing in waterlogged areas and previously dominated the highland system in the region. Furthermore, increased income from rice sales has not always been used for investing in other productive activities (either on or off-farm), or in improving household wellbeing. Local government officials and farmers alike reported that some people (mainly men) spent their surplus on alcohol and other frivolous activities. What long-term consequences these shifts in expenditure and behaviour have for local social relations remains to be seen. 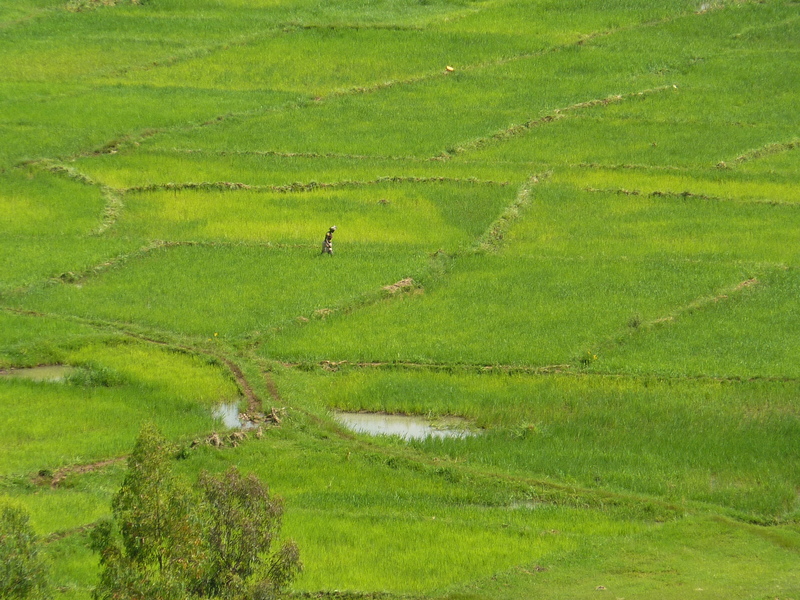 Despite these concerns, as we start our drive back to Bahir Dar, looking back down on to the Fogera Plain dotted with countless labourers weeding the bountiful rice crop, we can only be amazed at what seems to be a success story of rice and agrarian change. For our next round of fieldwork, we want to turn our attention to understanding the changing labour dynamics associated with rice, and to see whether all households in the area are ‘stepping up’ and even ‘stepping out’ as a result of their engagement with commercial rice production – or if some are only ‘hanging in’ or ‘dropping out’.